Since a large portion of our day is spent at the office, creating good work habits is important to maintaining a healthy lifestyle. By making a few small changes to your workday, you’ll become a healthier, happier person inside and outside of the office. Try the list of items below to start changing your habits today! Sometimes it’s tough to step away from your computer on a busy day but your body needs breaks to recharge. Implement a few easy things like standing every 30 minutes, getting out of the office for lunch or taking a walk with coworkers in the afternoon. Taking small breaks are good for your body and will help to boost your productivity levels. Staying hydrated throughout the day helps to curb hunger cravings, keeps your energy levels up and improves your general mood. To ensure that you stick with your water plan, fill up a water bottle or straw cup each morning when you arrive and set goals for when to refill during the workday. Instead of having a drawer of old Halloween candy and a bag of chips in your drawer, stock your desk with healthy snacks for those afternoon cravings. You are likely to snack regardless so having easy access to healthy alternatives will help you to make better decisions. Dried fruit or nuts make great snacks and will keep for a long time in your desk drawer. To help improve your mood during the workday, decorate your area with your favorite colors, frame pictures of loved ones, post positive affirmations, or and get a plant (live or faux). Seeing things that you enjoy will improve your mood and take some stress out of your day. Taking work home is becoming more and more common, but it’s important to set boundaries to prevent burnout from occurring. Constantly checking email or mindlessly scrolling through the next day’s tasks before bed not only takes you away from being present with your family and friends, but it also mentally exhausts you before the next day even arrives. Paper shredders aren’t something most people purchase more than once or twice in a lifetime. With such a wide range of prices and features, it can be overwhelming to decide which model is best for you. The guide below will walk you through the steps for choosing the right paper shredder for your home or office. The cut of a shredder refers to what happens when you put paper into the feeder of the machine. The type of cut you need will depend on what you are shredding and the security level your company requires. Click here for a cut guide. Selecting a spot for your shredder will help to determine the size you need. Does it need to fit under a desk or is it going in a large area next to your commercial printer? 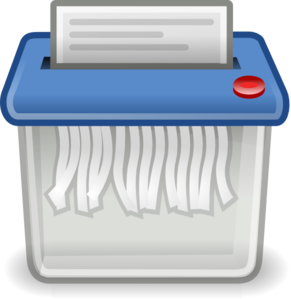 If space is not an issue, a larger bin will hold more paper and require less time emptying the machine. Machines also have various noise levels so if you are putting the shredder in an open office, consider choosing one with a lower decibel rating. Smaller, home-office models typically only handle a few sheets of paper at a time and require longer periods of time in-between uses to cool down. A commercial shredder will shred more sheets at a time and can be used continuously for longer periods of time. Some shredders are designed to handle more than just paper. Higher end models can destroy credit cards and CDs with sensitive as well. Some models have safety sensors that automatically stop the machine with a hand or object gets too close to the blades. Another bonus feature to consider is the technology that helps avoid frustrating paper jams. If you’re still unsure of which shredder is right for your office, use the Fellowes shredder selector tool or contact the Keeney’s customer service team for more assistance. In addition to being more sustainable and helping to support small businesses, shopping local helps to provide a positive economic impact on your community. Local stores recycle a much larger share of their sales revenue back into the local economy while chains funnel most of the dollars spent at their stores back to corporate headquarters or to distant suppliers. According to a study done by Civic Economics, if you were to spend $100 at an independent business, $68 dollars would go back into the community versus only $48 at a big box retailer. Due to the following factors, local retailers are putting 20% more back into the local economy, strengthening the community. Local retailers spend more than twice as much buying goods and services from other local businesses. They typically bank locally, hire local professionals, advertise in local media, and source inventory from local firms. With Valentine’s Day right around the corner, consider purchasing bouquets from a local florist, selecting a unique gift from a store in town or enjoying dinner at an independently owned restaurant with local flavors!